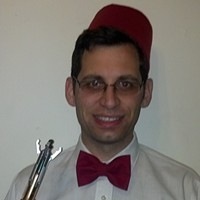 After spending time sewing my fez and bowtie and hunting down some suspenders, it’s time to reveal my Doctor outfit. The shirt, jacket, pants, and shoes (not pictured) were essentially free as I already owned these. 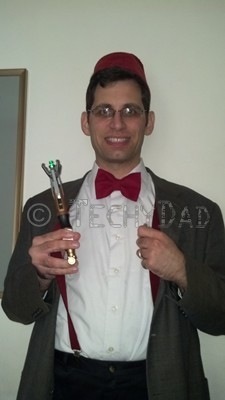 Same for the sonic screwdriver which was a birthday present. The suspenders came from Hot Topic and cost about $9.20. I made the bow tie myself out of materials that cost me about $1.30. 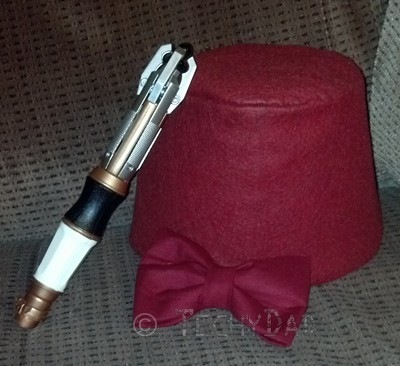 I also made the fez myself from materials that cost about $2. This means that the Doctor outfit only cost me about $12.50. Not bad. There’s one more piece to my costume, though. 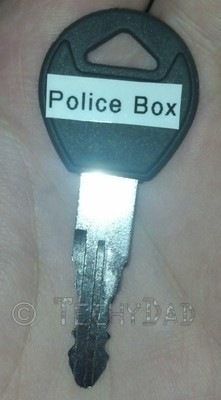 Yes, that’s a TARDIS key. This was a very easy project. Do you ever get junk mailings from car dealerships with keys? The intent is that you go to the dealership, try out the key, and you win a car if it fits in the car’s lock. Of course, the entire setup is a ploy to get you into a dealership so they can sell you a car (when your key inevitably fails to fit in a car). Instead of going to the dealership or tossing the key, I simply cleaned it off and used my label maker to make a "POLICE BOX" label for it. (Yes, I know the TARDIS key on the show is all silver and doesn’t say "POLICE BOX." Artistic license.) It’s a small detail that I’m sure nobody will see, but I liked making it. Now if only I can remember where I parked my TARDIS. Now I just need to wait one more day until Halloween so I can wear this costume while the boys go trick or treating. Is it Halloween yet? What about now? Man, time sure does go slowly when you don’t have a time machine!